Errol and Thomsen went to a wrapping party tonight at the community room. Thom was very proud of his bow. 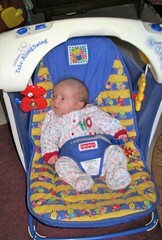 A friend of mine is loaning Vin this swing, and we are so thankful. It folds down easily, and it’s so nice to have somewhere to put the baby in the living room!